A review of public records show that Fulton County Commissioner Bill Edwards is currently six months behind on paying his property taxes. The Fulton County Tax Commissioner shows that Edwards, who is seeking re-election this year, owes $332.08 in back taxes on his home at 623 Grey Hawk Way in Fairburn, Georgia. Taxes were due 15 October 2013. Edwards was one of six Fulton County Commissioners who voted to raise south Fulton taxes higher than the tax rate [in parentheses] in Atlanta (10.240), Chattahoochee Hills (10.958), Fairburn (9.98), Palmetto (8.50), and Union City (10.598). 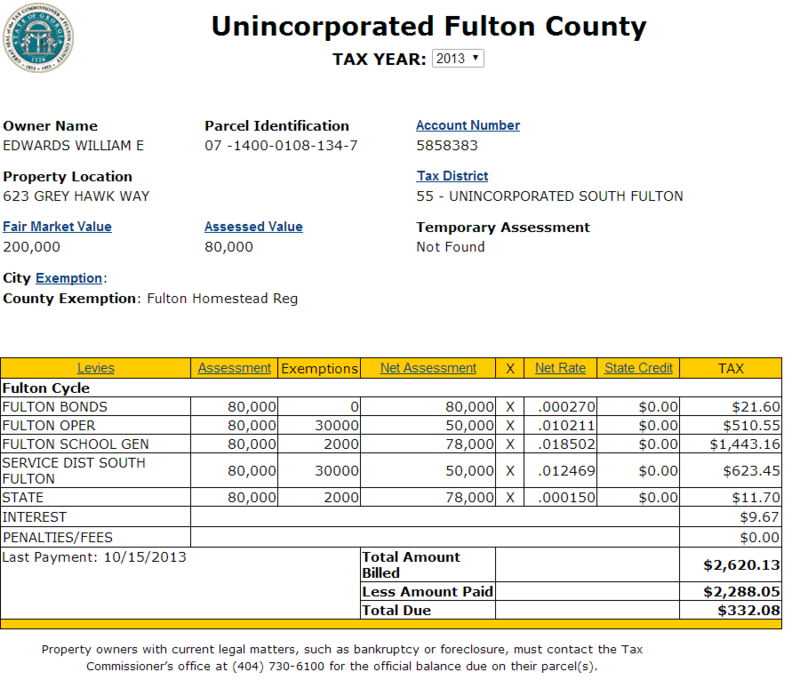 The South Fulton tax rate currently sits at 12.469.